Residents of the Etzion Bloc, south of Jerusalem, angered as Google search places them in Jordan. Where is Kibbutz Kfar Etzion located? Ask its residents and they will tell you that it is in the Etzion Bloc (Gush Etzion), south of Jerusalem, which was captured by Jordan in 1948 but liberated by Israel in 1967. The Google search engine seems to think otherwise, however, and this is making some residents upset. Some Israeli web surfers recently looked up information about religious Zionist settlement pioneer Rabbi Hanan Porat, as the second anniversary of his death is approaching. 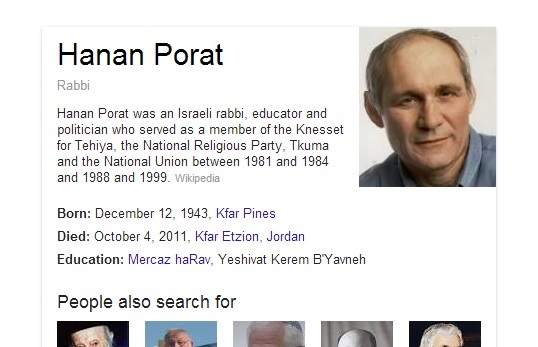 Besides a list of entries concerning Porat, the search results also yielded a concentrated summary of information about Porat next to his picture. The summary said that he died on October 4, 2011, at "Kfar Etzion, Jordan." This is not the first clash between Gush Etzion and Google. 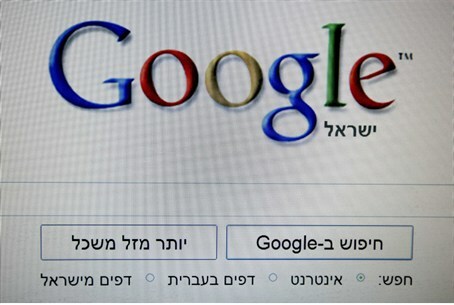 Several months ago, residents of the Bloc who were surfing the internet were surprised by Hebrew messages from Google that suggested they use the Palestinian Authority Google site, google.ps, instead of the Israeli google.co.il. The Legal Forum for the Land of Israel said that it had received angry phone calls from residents who felt they had been "harassed" by Google. The Forum's director, Nachi Eyal, sent a letter of complaint to the director of Google, in which he said: "It is regrettable that Google, which is a business company and not a political body, has determined that the residents of Judea and Samaria belong to the Palestinian Authority and harasses Hebrew-speaking users with offers to use the Palestinian browser." Google's response to the matter has not been received.